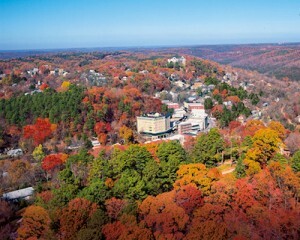 TripAdvisor announced their top 10 destinations in the U.S to view fall leaves and Eureka Springs is in the top five. Eureka Springs is the fifth best U.S. destination to view the autumn season. Read More. This Fall Season visit America’s Most Haunted Hotel and explore the hallways and experience lights out in the “morgue.” Some venture to this five story historic hotel with eagerness or skepticism, but we’ll let you be the judge of your own experience. Nightly ghost tours lead groups through the halls and down to the morgue sharing the many stories that have famed why the Crescent has become America’s Most Haunted Hotel. Daily, visitors share their images of orbs or strange reflections in the pictures they take. On numerous accounts a visitor will take a picture of the hallway or staircase, then take another photo directly after which will have something odd that appears in the photo that the visitor can’t explain nor remembers seeing. Others share their stories of feeling some type of energy around them, a poke or feeling light headed. Now its your turn to visit America’s Most Haunted Hotel! We’ve put together 2 popular ghostly hotel packages that will spark your interest. *Tip:Weekends in the Fall Season sell out, so book a weekday stay over and actually save money on the pkg. Share a hotel with “guests who checked out but never left.” America’s Most Haunted Hotel is waiting for you. *Saturday night only is based on availability.